Most people in aviation have heard about NextGen, the Federal Aviation Administration's (FAA's) vision for the future of national airspace management and control. That vision is quickly becoming a reality with the 2020 mandate for implementing Automatic Dependent Surveillance-Broadcast (ADS-B). ADS-B is the first step in the transition of Air Traffic Control (ATC) from a ground-based radar network to a satellite-based system. This FAA mandate will have a huge impact on the entire aviation industry, affecting, to a certain degree, every aircraft in U.S. airspace. In the simplest of terms, ADS-B is a satellite-based transmission system that allows aircraft to transmit (ADS-B Out) and receive (ADS-B In) information to and from ATC ground stations and other properly equipped aircraft. ADS-B Out will be mandated by the FAA in the airspace that now requires Mode-C transponder. ADS-B In, at this time, will be optional for most aircraft. As mentioned, ADS-B is just the first step in achieving all of NextGen’s goals. The following are other technologies related to NextGen that are being developed and tested. My team and I have spent the last few months finding and condensing information about ADS-B, which we hope will answer many of your concerns on ADS-B for your aircraft. 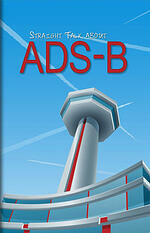 For a more in-depth look, read “Straight Talk About ADS-B” at www.DuncanAviation.aero/straighttalk/adsb. Feel free to contact our avionics experts with your questions and challenges when the subject of ADS-B arises. Matt Nelson serves as the Manager of Satellite Operations for Duncan Aviation’s avionics network and is a co-author of “Straight Talk About ADS-B.” He began working in aviation in 1987.